Role-based access control (RBAC) enables access management for Azure resources. Using RBAC, you can segregate duties within your team and grant only the amount of access to users, groups, and applications that they need to perform their jobs. Role-based access can be granted to users using the Azure portal, Azure Command-Line tools, or Azure Management APIs. Owner The Owner role allows access to all resources and actions within an Automation account including providing access to other users, groups, and applications to manage the Automation account. Contributor The Contributor role allows you to manage everything except modifying other user’s access permissions to an Automation account. Reader The Reader role allows you to view all the resources in an Automation account but cannot make any changes. Automation Operator The Automation Operator role allows you to view runbook name and properties and to create and manage jobs for all runbooks in an Automation account. This role is helpful if you want to protect your Automation Account resources like credentials assets and runbooks from being viewed or modified but still allow members of your organization to execute these runbooks. Automation Job Operator The Automation Job Operator role allows you to create and manage jobs for all runbooks in an Automation account. Automation Runbook Operator The Automation Runbook Operator role allows you to view a runbook’s name and properties. Log Analytics Contributor The Log Analytics Contributor role allows you to read all monitoring data and edit monitoring settings. Editing monitoring settings includes adding the VM extension to VMs, reading storage account keys to be able to configure collection of logs from Azure storage, creating and configuring Automation accounts, adding solutions, and configuring Azure diagnostics on all Azure resources. Log Analytics Reader The Log Analytics Reader role allows you to view and search all monitoring data as well as view monitoring settings. This includes viewing the configuration of Azure diagnostics on all Azure resources. Monitoring Contributor The Monitoring Contributor role allows you to read all monitoring data and update monitoring settings. Monitoring Reader The Monitoring Reader role allows you to read all monitoring data. User Access Administrator The User Access Administrator role allows you to manage user access to Azure Automation accounts. The following tables describe the specific permissions given to each role. This can include Actions, which give permissions, and NotActions, which restrict them. Microsoft.Automation/automationAccounts/ Create and manage resources of all types. Microsoft.Authorization/*/Delete Delete roles and role assignments. Microsoft.Authorization/*/Write Create roles and role assignments. Microsoft.Authorization/elevateAccess/Action Denies the ability to create a User Access Administrator. A Reader can view all the resources in an Automation account but cannot make any changes. Microsoft.Automation/automationAccounts/read View all resources in an Automation account. Microsoft.Automation/automationAccounts/hybridRunbookWorkerGroups/read Read Hybrid Runbook Worker Resources. Microsoft.Automation/automationAccounts/jobs/read List jobs of the runbook. Microsoft.Automation/automationAccounts/jobs/resume/action Resume a job that is paused. Microsoft.Automation/automationAccounts/jobs/stop/action Cancel a job in progress. Microsoft.Automation/automationAccounts/jobs/streams/read Read the Job Streams and Output. Microsoft.Automation/automationAccounts/jobs/output/read Get the Output of a job. Microsoft.Automation/automationAccounts/jobs/suspend/action Pause a job in progress. Microsoft.Automation/automationAccounts/jobSchedules/read Get an Azure Automation job schedule. Microsoft.Automation/automationAccounts/jobSchedules/write Create an Azure Automation job schedule. Microsoft.Automation/automationAccounts/linkedWorkspace/read Get the workspace linked to the automation account. Microsoft.Automation/automationAccounts/read Get an Azure Automation account. Microsoft.Automation/automationAccounts/runbooks/read Get an Azure Automation runbook. Microsoft.Automation/automationAccounts/schedules/read Get an Azure Automation schedule asset. Microsoft.Automation/automationAccounts/schedules/write Create or update an Azure Automation schedule asset. Microsoft.Resources/subscriptions/resourceGroups/read Read roles and role assignments. Microsoft.Resources/deployments/* Create and manage resource group deployments. Microsoft.Insights/alertRules/* Create and manage alert rules. Microsoft.Support/* Create and manage support tickets. Microsoft.ClassicCompute/virtualMachines/extensions/* Create and manage virtual machine extensions. Microsoft.ClassicStorage/storageAccounts/listKeys/action List classic storage account keys. Microsoft.Compute/virtualMachines/extensions/* Create and manage classic virtual machine extensions. Microsoft.OperationalInsights/* Manage Azure Monitor logs. Microsoft.OperationsManagement/* Manage solutions in workspaces. Microsoft.Resources/subscriptions/resourcegroups/deployments/* Create and manage resource group deployments. Microsoft.Storage/storageAccounts/listKeys/action List storage account keys. Microsoft.OperationalInsights/workspaces/analytics/query/action Manage queries in Azure Monitor logs. Microsoft.OperationalInsights/workspaces/search/action Search Azure Monitor log data. Microsoft.OperationalInsights/workspaces/sharedKeys/read Not able to read the shared access keys. Microsoft.AlertsManagement/alertsSummary/* Manage the Alert dashboard. Microsoft.Insights/components/* Manage Application Insights components. Microsoft.Insights/Register/Action Register the Microsoft.Insights provider. Microsoft.Insights/webtests/* Manage Application Insights web tests. Microsoft.OperationalInsights/workspaces/intelligencepacks/* Manage Azure Monitor logs solution packs. Microsoft.OperationalInsights/workspaces/savedSearches/* Manage Azure Monitor logs saved searches. Microsoft.OperationalInsights/workspaces/search/action Search Log Analytics workspaces. Microsoft.OperationalInsights/workspaces/sharedKeys/action List keys for a Log Analytics workspace. Microsoft.OperationalInsights/workspaces/storageinsightconfigs/* Manage Azure Monitor logs storage insight configurations. The following tables show the minimum required permissions needed for onboarding virtual machines for the change tracking or update management solutions. 1 This permission is needed to onboard through the VM portal experience. 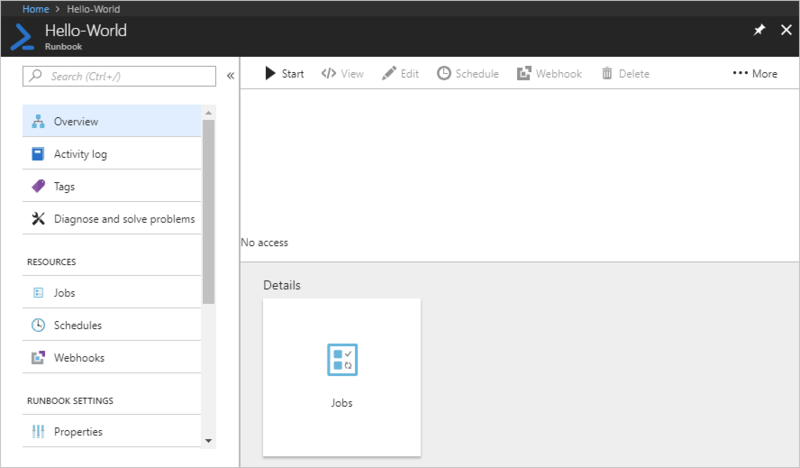 Log in to the Azure portal and open your Automation account from the Automation Accounts page. Click on the Access control (IAM) control at the top left corner. This opens the Access control (IAM) page where you can add new users, groups, and applications to manage your Automation account and view existing roles that can be configured for the Automation account. 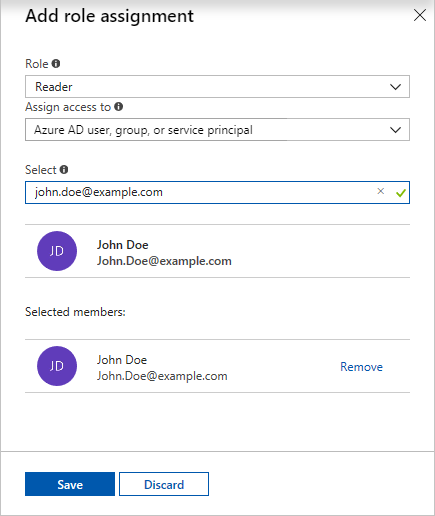 From the Access control (IAM) page, click + Add role assignment to open the Add role assignment page where you can add a user, group, or application, and assign a role to them. Select a role from the list of available roles. You can choose any of the available built-in roles that an Automation account supports or any custom role you may have defined. Type the username of the user you want to give permissions to in the Select field. Select the user from the list and click Save. You can also assign a role to the user from the Roles page. Click Roles from the Access control (IAM) page to open the Roles page. From here, you can view the name of the role, the number of users and groups assigned to that role. Role-based access control can only be set at the Automation account scope and not at any resource below the Automation account. From the Access control (IAM) page, select the user wish to remove and click Remove. Click the Remove button in the assignment details pane. Get-AzureRmRoleDefinition lists all RBAC roles that are available in Azure Active Directory. You can use this command along with the Name property to list all the actions that can be performed by a specific role. Get-AzureRmRoleAssignment lists Azure AD RBAC role assignments at the specified scope. Without any parameters, this command returns all the role assignments made under the subscription. Use the ExpandPrincipalGroups parameter to list access assignments for the specified user as well as the groups the user is a member of. Example: Use the following command to list all the users and their roles within an automation account. 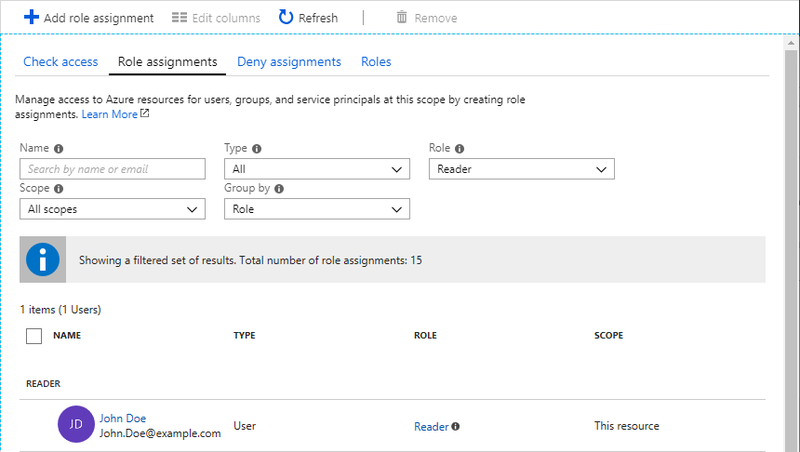 New-AzureRmRoleAssignment to assign access to users, groups, and applications to a particular scope. Example: Use the following command to assign the "Automation Operator" role for a user in the Automation account scope. Use Remove-AzureRmRoleAssignment to remove access of a specified user, group, or application from a particular scope. Example: Use the following command to remove the user from the “Automation Operator” role in the Automation account scope. In the preceding examples, replace sign in Id, subscription Id, resource group name, and Automation account name with your account details. Choose yes when prompted to confirm before continuing to remove user role assignment. When a user, who is assigned to the Automation Operator role on the Automation Account scope views the Automation account they are assigned to, they can only view the list of runbooks, runbook jobs, and schedules created in the Automation account but can’t view their definition. They can start, stop, suspend, resume, or schedule the runbook job. The user does not have access to other Automation resources such as configurations, hybrid worker groups, or DSC nodes. Azure Automation allows for you to assign RBAC to specific runbooks. To do this run the following script to add a user to a specific runbook. The following script can be ran by an Automation Account Admin or Tenant Admin. $rb = Get-AzureRmResource -ResourceGroupName $rgName -ResourceType "Microsoft.Automation/automationAccounts/runbooks" -ResourceName "$automationAccountName/$rbName"
# The Automation Job Operator role only needs to be ran once per user. 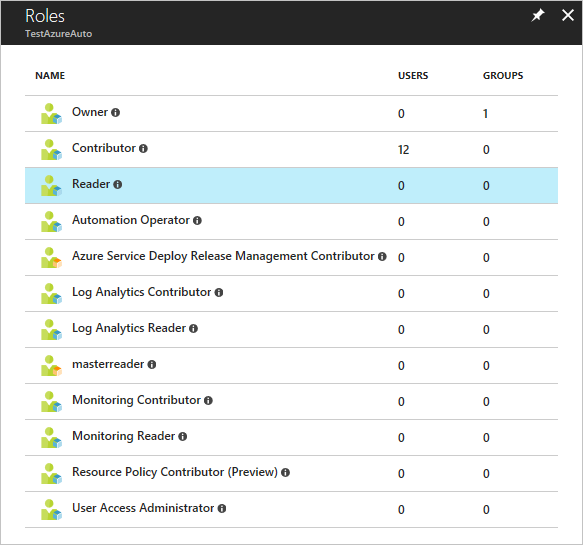 Once ran, have the user log in to the Azure portal and view All Resources. In the list they see the Runbook they were added as a Automation Runbook Operator for. When a user, who is assigned to the Automation Operator role on the Runbook scope views a Runbook they are assigned to, they can only start the runbook and view the runbook jobs. For information on different ways to configure RBAC for Azure Automation, refer to manage RBAC with Azure PowerShell.